Remarkably, three major Hollywood studios — Walt Disney, Lucas Films and Warner Brothers — all chose Michael L. Kungl to portray their cartoon characters. This genial giant's art has featured in movies (Hall Pass, Smoke) and TV shows (CSI, Law & Order, Gilmore Girls, Big Bang Theory, Beauty and the Geek), and is sought by collectors in North America, Europe, Japan and Australia ...including George Lucas. "My favorite project was 28 pieces of art for Disneyland Paris. It included ten, 20-foot wide murals with over 25 Disney characters. I also designed eight bas relief sculptures that are each 16 feet wide. That work took nearly a year to complete." Why cars and cartoons? As a kid, Mike was crazy about cars, playing with a huge collection of Hot Wheels — and laughing at TV cartoons in the company of his dogs, cats and hamsters, he naturally developed a love for animal characters. “Working with all the licensed characters for major publishers has enabled me to paint all my favorite childhood cartoon characters — Bugs Bunny being one of my personal favorites." With an education in graphic design, advertising and fine art, Kungl began his career with success in the advertising field. He became a well-known name in the industry for his dynamic design and illustration style, creating award-winning work for some of the world’s biggest companies, including Nissan, Panasonic, Bank of America and Johnson & Johnson. His switch to fine art was sparked the day he saw A.M. Cassandre’s iconic Normandie poster (1935) in a Los Angeles gallery. The artist was inspired to craft his own poster art, capturing the essence this most stylish era. He blended Art Deco and Moderne influences, whilst adding a touch of the Twenty-First Century to create a style uniquely his own. Within two years he was selected to create the 25th anniversary poster for Miami Beach’s annual Art Deco Weekend in Florida. He was also commissioned by Laguna Beach to create a monumental painting for their city center in California. Kungl’s inspirations come from his vast resource library of vintage advertising, books, old photos, and a variety of nostalgic sources collected over the years. Starting from a rough sketch, he works and reworks each image with diligent precision. The result is a rich and unique interplay of textures, and a beautiful contrast of lush curves and streamlined objects. This artist is now among the world’s finest in the Art Deco tradition. Though influenced by Cassandre and fathers of industrial design like Dreyfuss and Loewy, Kungl's artworks are infused with a vitality and freshness that reflect his energy and contemporary viewpoint. 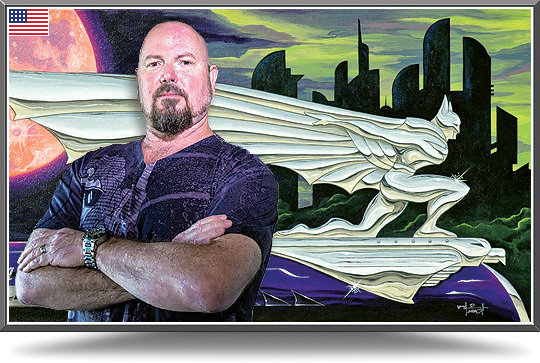 Commission Mike to create a unique artwork or mural for you!